Although I’m easily seduced by yarn, glue and paper punches and such, I do live by a few craft-buying money-saving rules. Daphne’s list of ten things to keep in mind when crafting on a budget pretty much sums up my approach. Consider buying kits. They give you just what you need without overbuying. 20 Must-Do Crafts for July! Tipnut’s Crafters Medley for July is replete with a variety of oh-so-clever projects, you’re sure to find something you just HAVE to try. Tops on my list are the cookbook apron, and the brown paper seed packet business cards tutorial. When you blow out your very fav summer khakis, something has to be done. DON'T discard just because of a little wear and tear. These khakis came with the frayed hem for the broken in look, we won't mess with that. The big problem happened later, as seen below, on the front and back of these well worn shorts. The technique used to mend these tears is exactly like the Ottoman Tear Repair. Same technique-many uses. 10 cool things to make out of dish towels. Dish towels aren't just for drying dishes anymore. Case in point, TipNut has put together a list of ten clever craft projects using the familiar rectangular cloths. 3. Dishtowel chair slip covers. 8. Dishtowel Grocery bag holder. 9. Dishtowel dog rope toy. Seashell season is upon us. Instead of bringing them home from the beach and simply depositing them in a clear glass bowl, we might want to try a few of these really cool ideas from the Queen of Good Things. How about making seashell string lights? 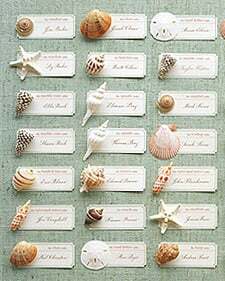 Keepsake place cards for a beach side wedding--or beach-themed party--couldn't be more appropriate! Large shells would make fabulous bookends. Tampon Crafts...For Any Time of the Month. 10 Ways to Reuse Old Sweaters. Your winter clothes are out of storage again, and some of your sweaters might not look as presentable as when you put them away last year. Farrah Parkes from DIYLife has assembled some of the best tutorials 'round the 'net for recycling you sweaters.